A caramelised onion chutney... A true delight! Finely chopped, slow-cooked caramelised onions. Dates and apples cooked together with the onions bring added sweet and tangy flavours to the chutney. Delicious with cheese, red meat of a beef sandwich. Highfield Preserves is an english family business specialized into chutneys and marmelades. Highfield Preserves is an English family business born in 1983 in Devon. The Fraiser family strives to elaborate the most delicious craft recipes: each ingredient is carefully selected to retain all the flavours in each pot. 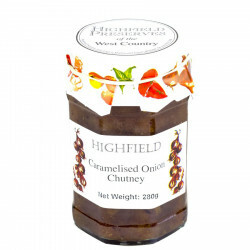 Highfield Preserves prepares only recipes without any artificial colourings or preservatives. Spice up your meals with a genuine British chutney range! Ingredients: onions (40%), sugar, white wine vinegar, apples, dates, grapeseed oil, mustard seeds, salt, spices. Without any artificial colourings or preservatives. Great Taste Awards 2012 (The English "Oscars" of fine food).